"First Light" was achieved in May 1998 for VLT ANTU, the first 8.2-m Unit Telescope at the Paranal Observatory. Since then, thousands of detailed images and spectra of a great variety of celestial objects have been recorded with this major new research facility. While some of these were obtained for scientific programmes and were therefore directed towards specific research needs, others were made during the "Commissioning Phases" in 1998/99 for the two major astronomical instruments, FORS1 (FOcal Reducer and Spectrograph) and ISAAC (Infrared Spectrometer And Array Camera). They were carried out in order to test thoroughly the performance of the telescope and its instruments before the new facility was handed over to the astronomers on April 1, 1999. The Commissioning data are accordingly of variable quality and, contrarily to the science data, normally not intensity calibrated. However, while some of these frames are short test exposures that mainly served to ascertain the image quality under various observing conditions, a substantial fraction still contains scientifically valuable data. As planned, and in order to facilitate the exploitation of this useful material, ESO has today released over 10 Gigabytes of ANTU Commissioning data (and some additional test data from before April 1, 1999), obtained in the various observing modes of FORS1 and ISAAC . They encompass a total of 2235 files and are now available to astronomers and other interested parties in the ESO Member States. Information about this release and on how to obtain the data on CD-ROM or in electronic form is now available via the Science Archive Facility website. A special page with the list of raw science data frames included in this release has been set up. Searches for specific data (e.g., by object, sky field, filter, time of observation; calibration files, etc.) can be made from the ESO Science Archive Data Products page. These Commissioning data are "raw" in the sense that they come directly from the instrument. The original files are recorded in standard FITS-format and in order to save space, they have been compressed by a factor of about 2. Before they can be used, they must therefore first be decompressed and subjected to image processing, e.g. with the ESO MIDAS system, available on a special MIDAS CD-ROM from ESO. 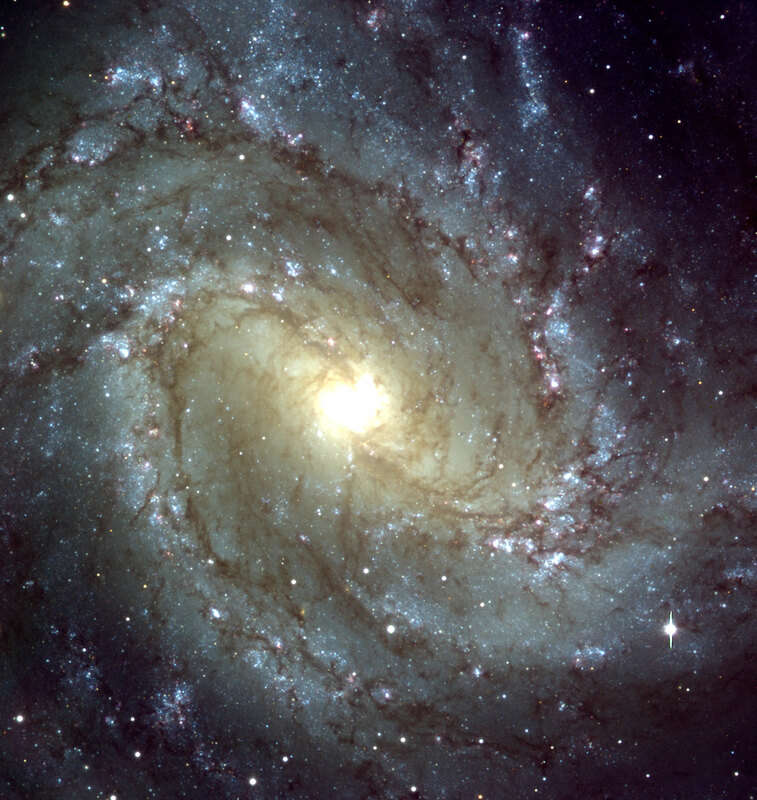 The above image of a well-known spiral galaxy, Messier 83 , was prepared by superposing three CCD frames from this data release that are now available in the archive. This galaxy is located in the southern constellation Hydra (The Water-Snake) and is also known as NGC 5236 ; the distance is about 15 million light-years. The spiral structure resembles that of the Milky Way Galaxy in which we live, but Messier 83 also possesses a bar-like structure at the centre. Corresponding frames of many other interesting objects are included among the data now released. A small part of these have served to produce some of the VLT Astronomical Images that have been released at the ESO Outreach website during the past year. Observations continue with the first two VLT Unit Telescopes, ANTU and KUEYEN ; the latter is still in the Commissioning Phase with the UVES and FORS2 instruments until it will be made available to the astronomers on April 1, 2000. The current VLT data production rate is about 2200 files/week, corresponding to about 10 Gigabytes or 16 CD-ROMs. Efficient data handling procedures developed by ESO ensure a rapid and secure transfer from the telescopes at the Paranal Observatory to the data archive at the Garching Headquarters, and from here to the receiving astronomers. A description of the main features of this "VLT Data Flow System" is available in eso9910. The amount of data will increase as more instruments enter into operation and will ultimately reach about 40,000 Gigabytes/year. The next major event will be the "First Light" for the third Unit Telescope, MELIPAL , now expected in February 2000. The preparations are proceeding well, with the 8.2-m main mirror of Zerodur about to be coated during the next days. The fourth telescope, YEPUN , will follow later next year.